Kingscliff accommodation (accomodation) holiday apartments, caravan parks, motels and resorts. Tweed Coast accommodation tours and attractions guide for visitors. Kingscliff New South Wales, NSW, 2487, also Chinderah and Fingal Head, kingscliff australia accomadation. Just south of Tweed Heads, Kingscliff (not Kingscliffe), with a population of just over 9000, is a beach community offering a wide variety of holiday accomodation and water based activities. 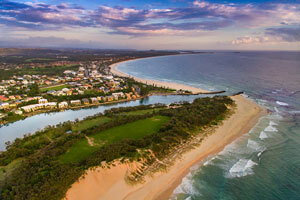 Kingscliff aerial view © Photo courtesy of Sunrise Cove Holiday Apartments. Together with the villages of Chinderah and Fingal Head, it is a popular family destination which provides beach and estuary access for swimming, surfing (of course! ), fishing and water sports. The area is is short drive to Tweed Heads and its sporting clubs, just 10 minutes drive from the southern Gold Coast, and about 45 minutes drive to Mt Warning and Lamington National Parks. Accommodation to suit all budgets can be found in the area. Serviced holiday apartments, holiday flats and self contained units, quaint bungalows, motels, caravan parks and holiday parks provide an affordable range of places to stay, while the resort developments at Casuarina to the south, offer 5 star beachside apartments or luxury holiday rentals, if that's your style. Alfresco dining is a feature of Marine Parade, with a wide variety of award winning restuarants offering world cuisines to tempt your tastebuds. On weekends, live entertainment is available at the local sporting clubs and hotels. Week long "Foodie" Festivals are now regular events on the local calendar, while monthly Farmers and Weekend Markets are held at beachside parks; with the Casuarina Farmers' Market on the 1st and 3rd Saturday and Kingscliff Lions Beachside Market on the 2nd and 4th Saturday. Four boat ramps provide access to the estuary of the Tweed River and broadwaters. An ocean ramp at Kingscliff, ensures many offshore reefs can be reached when conditions for crossing the bar are suitable. 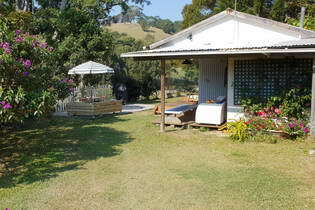 Chinderah is nestled on the Tweed river about 5 minutes drive from Kingscliff. It has superb river access to the Chinderah and Tweed broadwaters, and provides a good standard of caravan park and motel accommodation. Cudgen Creek is a major attraction. Riverside reserves offer excellent BBQ and picnic facilities, and sandy shorelines suitable for paddling. During the warmer months, swimming and snorkeling in estuary is a fun family activity. Fishing, canoeing and kayaking along the upper reaches of the creek are also popular activities. Alternatively, you can hire a BBQ boat or take a river cruise and explore Tweed River. Bicycle paths and walking tracks run from Kingscliff to Pottsville Beach in the south. Another local attraction is Tropical Fruit World (the original Big Avocado), a working fruit plantation featuring the world's largest variety of rare and tropical fruits, rides, a cafe, fruit shop and gift shop. Encompassing Cudgen Lake and Round Mountain, and straddling Clothiers Creek Road, Cudgen Nature Reserve is located 9 km south of Kingscliff. Cudgen Burial Ground: The Cudgen Burial Ground and South Sea Islander Memorial adjacent to the Chinderah Golf Course and Driving Range, is an Australian Heritage Commission site dedicated on the 24th of June 1997. This solemn memerial commerates the contribution of the more than 62,000 South Sea Islanders, many of whom were "blackbirded" (kidnapped) from their villages, and landed on Australian shores from 1863 to 1904, to work as indentured labour in the sugar cane fields and banana plantations of Queensland, and as timber fellers in the "Cudgen scrub." 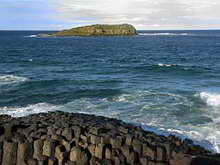 Fingal Head was named after Fingal in Ireland, because the basalt headland was thought to be similar to the famous Giants Causeway there. The beach and lighthouse can be reached through remnant coastal rainforest which is being regenerated by the nationally recognised and award winning efforts of the Fingal Dune Care Group and Kingscliff High School. Visit the "Giants Causeway", watch dolphins play in the offshore surf, and search for Humpback whales as they travel past on their annual migration each year. While former beach shacks have redeveloped into larger family homes, Fingal remains a small village at the mouth of the Tweed River, despite the efforts of developers with more ambitious plans, and accommodation is limited to the TSC holiday park and a number of luxury holiday house rentals. A well stocked general store and Australia Post agency, tinnie (dinghy boat) hire, a local art gallery and cafe, Fingal Head lighthouse and a sandy beach are worthy of a leisurely visit. Plentiful BBQ and picnic facilities are dotted along the river bank reserves, with views to the Tweed Heads skyline opposite. At low tide the exposed sand banks on the Tweed River are visible from Fingal Head Rd, providing a delightful opportunity for birdwatchers to spot a few mangrove zone species and waders, or perhaps even a Black necked stork. Cook Island and Giants Causeway Photo © courtesy of Dede Callichy. Cook Island: Many sea going bird species frequent Fingal Headland and Cook Island just offshore. Originally called Turtle Island in 1823 by John Oxley when his party took shelter in the lea of the 10-acre islet during a storm, it was renamed in 1828 by Captain Rous, after Lieutenant James Cook. It's now a marine reserve and a popular scuba diving spot of 6 - 20 metres, with soft and hard coral reefs, and an abundance of reef and pelagic fish species. Stingrays, turtles (of course!) and wobbegongs are residents, while Leopard sharks visit during summer. Getting here is easy: Located just a few minutes from the Pacific Highway, Kingscliff is about 11 hours drive north from Sydney and about 70 minutes drive south from Brisbane, via the Pacific Motorway. Local bus services travel from Pottsville in the south via Kingscliff, to Tweed Heads, the Gold Coast and theme parks in the north. Daily interstate coach services are available are available from Brisbane and Sydney, and daily or overnight train from Sydney to Brisbane via coach transfer at Casino. Visit Kingscliff - Transport Services Information for more transport information, including trains, coach and local bus schedules, taxis, airport, and transfer services. Northern Rivers Carpool provides locals and visitors with the opportunity to share transport in the region.